When your furniture fabric gets dull or stained, you can clean it with an upholstery shampoo or cleaner. There are a few different options and it's always best to read all instructions for the shampoo or cleaner prior to starting to clean. Take note of any special fabric considerations as some materials (such as leather, silk, etc.) will require special techniques or cleaning materials. Apply the liquid shampoo formula with either a carpet cleaner's handheld rotary brush attachment specially made for upholstery, or clean it by hand by mixing the carpet and upholstery formula in warm water and applying it with a soft scrub brush. If you're cleaning by hand, always sponge the area with a dry towel to remove some moisture when the cleaning is done, to help the drying process. Expect a chair or other upholstered furniture to take several hours to fully dry. When using a carpet cleaning machine, be sure to follow the manufacturer's directions and use the recommended cleaner for the particular equipment you are using. 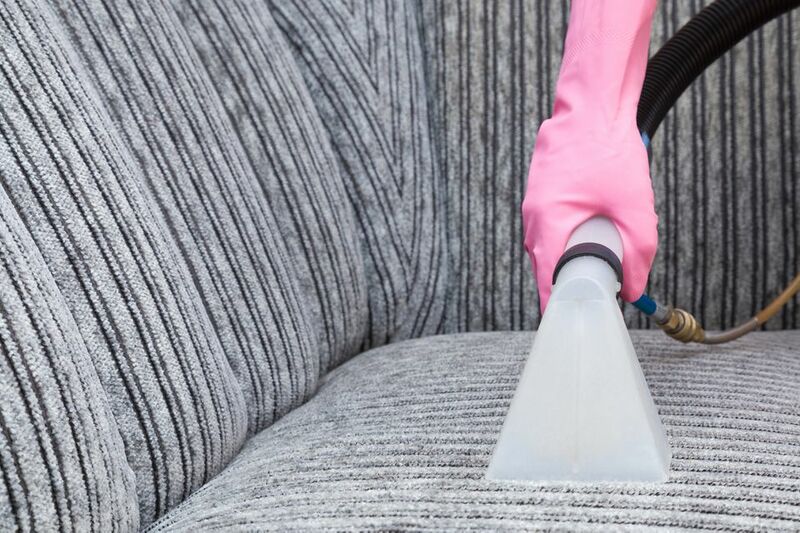 Regardless of what type of cleaning formula you are using, it is wise to do an initial test cleaning on a 'hidden' section of upholstery to ensure it will not damage your fabric. Another furniture cleaning alternative is an upholstery shampoo that has its own applicator built right into the aerosol can. One example is the Bissell Upholstery Shampoo and it comes with a soft rubber applicator brush attached to the top of the can. Simply shake the can and press the button to release a shampoo foam. Apply the cleaning foam with a gentle rotating motion. Repeat as required to remove stains. Let the upholstery dry. A second or third application may be required. The Bissell Upholstery Shampoo does a good job to freshen fabrics and brighten patterns and colors while removing stains. It's handy to have a can on hand for quick touch-ups or spot removing. It also works well on automobile upholstery to remove occasional stains. Hand cleaning upholstery is a tedious and labor-intensive task. If you have several pieces of furniture to clean, you can save a lot of time and effort by using a carpet cleaner that has an upholstery attachment. These can often be rented from local appliance or hardware stores. As always, follow all directions and if possible test clean a spot on a hidden area before cleaning your entire piece of furniture. Another consideration may be to purchase a small carpet cleaner with an upholstery attachment—it's a convenient and worthwhile investment even if you do not have any carpets, but like to clean your furniture fabric regularly. You'll also find it handy for cleaning your vehicle upholstery. Portable carpet spot cleaners are handy for removing stains on carpeting, but often do not work well on furniture upholstery simply because of their design. If you hate cleaning your upholstery, you can opt for a pet-friendly, easy-to-clean fabric. What Are the pH Levels of Common Cleaning Supplies?